Computer hardware life is looking much brighter now that AMD has forced Intel’s hand. The new 6 core, 12 thread, 8th Gen, mainstream chip is the kind of processor Intel should’ve released 5 years ago. On the plus side, Biostar keeps shelling out some surprisingly nice looking boards to handle each new iteration. Check out the latest in the Racing lineup with the Z370GT7 and stay posted for more news and reviews! BIOSTAR revamps the RACING series motherboards with a much more flashy and high-end design with a golden black color theme. Gold I/O Armor – Gold I/O Armor strongly protects I/O interfaces and components from static electricity. The RGB LED lights on top of the armor are controllable with the Advanced VIVID LED DJ for more lighting control. 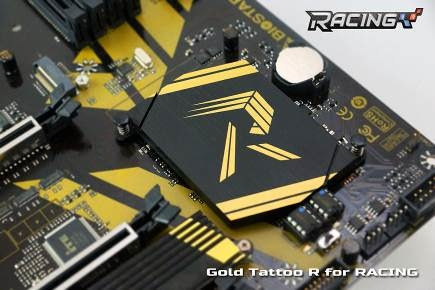 Gold Tattoo RACING R – The classic “R” sign on the heatsink shows the spirit of RACING Series. RGB Rainbow Lighting Effect – 10 flashing modes for RGB lighting effect bring you more customization fun via Advanced VIVIVD LED DJ utility. Gold PCB Treatment – The 3rd Gen RACING Z370 motherboards ascend to a higher level of luxury and fashion for your gaming world! 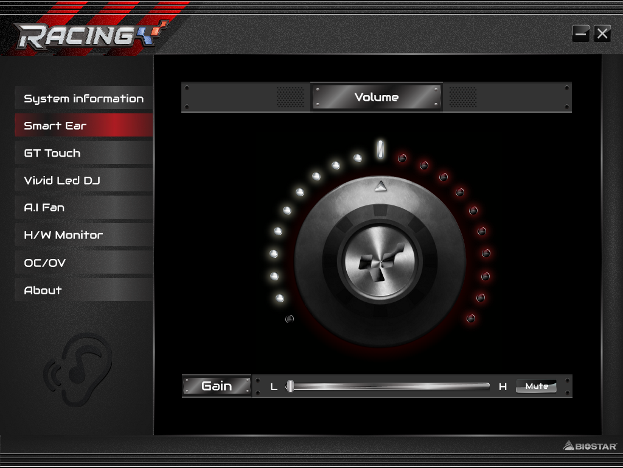 The RACING Z370GT7 features aim to protect your components from overheating by custom control of each individual fan controller with A.I. 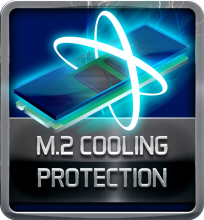 FAN Utility and a Dual M.2 cooling protection. The new intuitive and easy-to-use A.I. FAN utility smartly allows users to have fully customized fan modes. Users can use fan curves to define fan speeds for specific temperatures to optimize cooling performance while gaming, film editing or any kind of high load usage scenario. With more cooling options hybrid fan headers support both PWM and DC fans to meet different user demands. 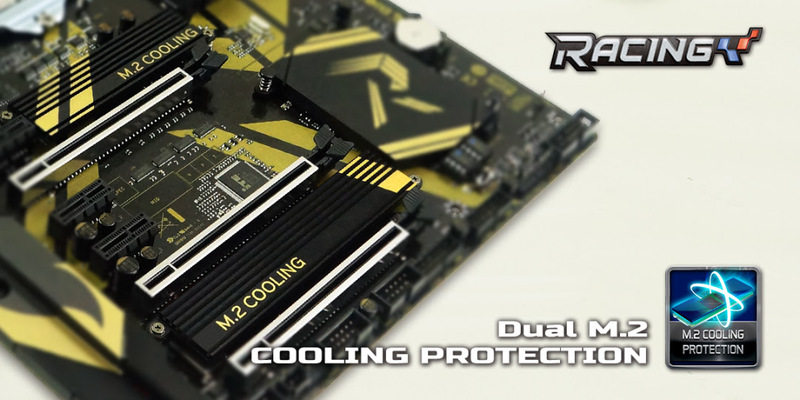 RACING Z370GT7 boasts dual gold M.2 heatsinks featuring ultra-high cooling efficiency to protect the M.2 connector areas and the chipset area from thermal problems and extend M.2 slots and M.2 storages’ lifespan for long-term and stable operation. 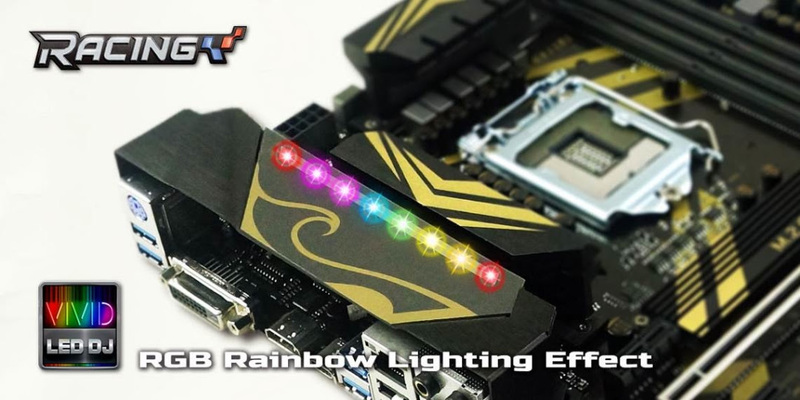 The RACING Z370GT7 sports Advanced VIVID LED that has 10 lighting effects on three lighting areas of the motherboard along with two 5050 LED headers enabling builders to add more RGB lighting. Advanced VIVID LED DJ – Users can control color, speed and brightness via 10 different flashing modes to control three RGB LED lighting zones independently. 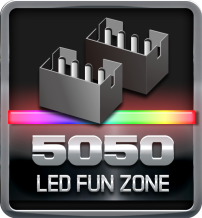 5050 LED FUN ZONE – The 5050 LED FUN ZONE comes with two 5050 LED headers to bring more colorful lighting options to builders allowing you to add more RGB fan or any kind of LED product. 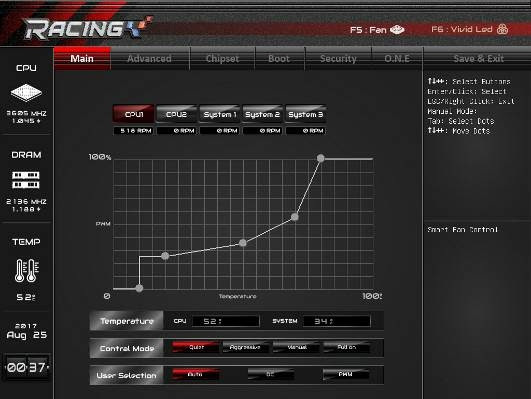 BIOSTAR improves the BIOS Utility for the RACING Z370 Series motherboards with a more intuitive and user-friendly design. 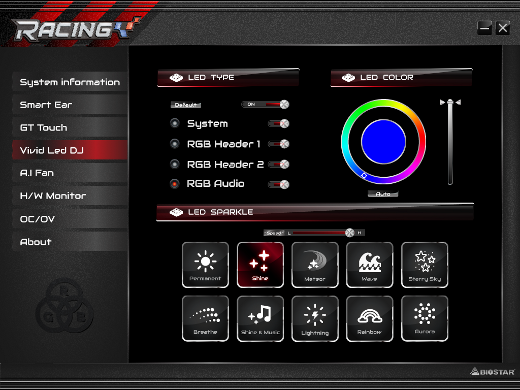 The Advanced VIVID LED DJ and A.I Fan utilities are now integrated into the new 3rd Gen RACING Series BIOS. 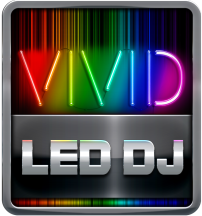 Advanced VIVID LED DJ in BIOS – The Advanced VIVID LED DJ with four RGB flashing modes in BIOS allows LED enthusiasts to define their PC color schemes and exclusive personal styles. A.I. 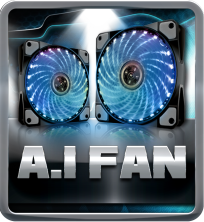 FAN in BIOS – With the newly cooling design A.I FAN users can control fan speeds with ease to ensure that their gaming and heavy-load systems operate with the best cooling performance without any annoying thermal problems. You can use fan curves to define specific temperatures and fan speeds for optimal cooling performance. 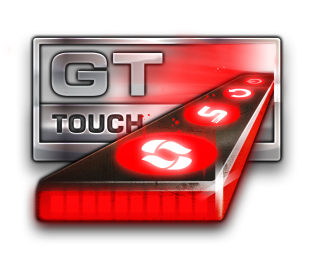 GT Touch – Enable the ECO and Sport button on GT touch panel through the GT Touch utility in the BIOS. New Smart EAR Interface – A windows-based audio utility which allows you to easily adjust system volume and optimize your headphone performance. 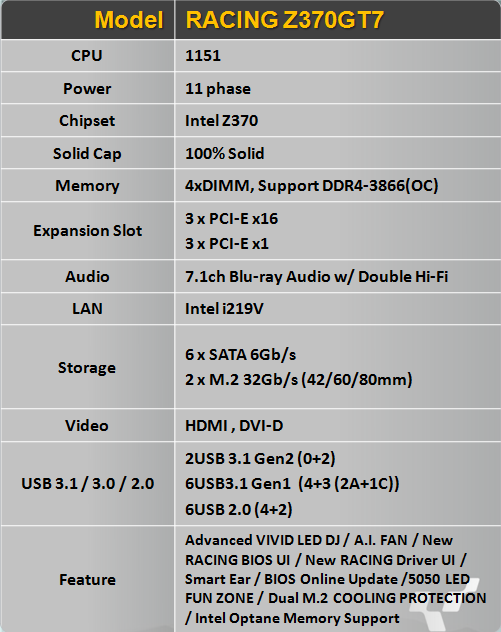 BIOSTAR RACING Z370GT7 rear I/O ports have the legacy PS/2 connector support, 2 x USB 3.1 Gen2 Port, 1 x USB 3.1 Gen1 Type-C Port, 2 x USB 3.1 Gen1 Port 2 x USB 2.0 Port, 1 x HDMI Connector, 1 x DVI-D Connector, 1 x RJ-45 Port and 6 x Audio Connectors. BIOSTAR RACING Z370GT7 is the latest flagship motherboard that maximizes the latest 8th generation Intel Core processors performance, making it a great choice for any gaming, overclocking, content creating or modding system you are looking to build. 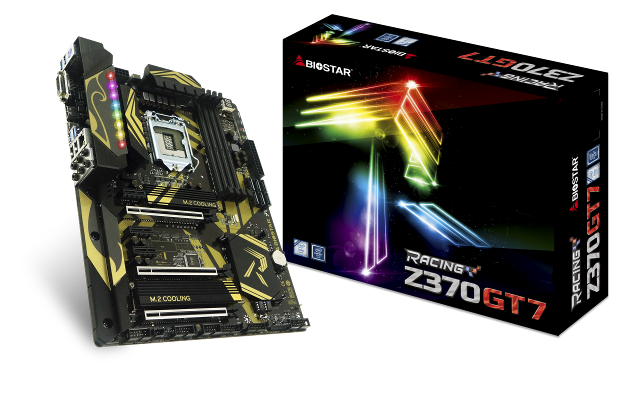 BIOSTAR RACING Z370GT7 Motherboard comes with an MSRP of $149.99.